Biotite is a common phyllosilicate mineral within the mica group. Its approximate chemical formula is K(Mg, Fe)3AlSi3O10(F, OH)2. This mineral is usually dark green to brown or black. It can be transparent to opaque, has a vitreous to pearly luster, and a gray-white streak. When weathered, its crystals appear sparkly yellow and are sometimes referred to as "fool’s gold." (Although, Pyrite is the official "fool’s gold.") Large chunks of biotite are called "books" because they resemble books with many pages. In a broader sense, biotite refers to the dark mica series, primarily a solid-solution series between the iron endmember annite and the magnesium endmember phlogopite. Aluminum-rich endmembers include siderophyllite. Geologists study biotite-containing rocks extensively, as this mineral is useful in their efforts to assess the minimum ages of rocks and the temperature histories of metamorphic rocks. Practical uses for this mineral have yet to be developed, but it is used in industry as a heat insulator. Also, it forms part of mineral collections. Biotite was named by Johann Friedrich Ludwig Hausmann in 1847. He gave the name in honor of the French physicist Jean-Baptiste Biot, who discovered the optical properties of micas in 1816. This mineral is found in a wide variety of igneous rocks and metamorphic rocks. For instance, biotite occurs in the lava of Mount Vesuvius and at Monzoni. It is an important phenocryst in some varieties of lamprophyre. It is also an essential constituent of many metamorphic schists, and it forms in suitable compositions over a wide range of pressures and temperatures. 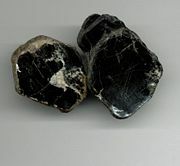 Biotite is occasionally found in large sheets, especially in pegmatite veins, as in New England, Virginia, and North Carolina. Other notable occurrences include Bancroft and Sudbury, Ontario. It is mined by quarrying or underground mining, depending on its depth of occurrence. Biotite is a sheet silicate with a hardness of 2.5-3 on the Mohs scale and a specific gravity of 2.7-3.1. It consists of flexible sheets, or lamellae, that easily flake off. The sheets are made of iron magnesium aluminum silicate and are weakly held together by potassium ions. This mineral is sometimes called "iron mica" because it is more iron-rich than phlogopite. It may also be called "black mica," to distinguish it from "white mica" (muscovite)—both are formed in some rocks, sometimes side-by-side. Like other mica minerals, biotite has a highly perfect basal cleavage. Its crystals belong to the monoclinic crystal system. Each crystal has four prism faces and two pinacoid faces to form a pseudohexagonal shape. Although not easily seen because of the cleavage and sheets, its fracture is uneven. Biotite is used extensively to constrain the ages of rocks, by either potassium-argon dating or argon-argon dating. Because argon escapes readily from the biotite crystal structure at high temperatures, these methods may provide only minimum ages for many rocks. Biotite is also useful in assessing temperature histories of metamorphic rocks, because the partitioning of iron and magnesium between biotite and garnet is sensitive to temperature. In practical terms, biotite has few uses. One application is as a heat insulator in industrial settings. It is valued for collection purposes. Mineral Gallery. 2006. The Mineral Biotite Amethyst Galleries. Retrieved May 14, 2007. All links retrieved June 10, 2016. This page was last modified on 10 June 2016, at 18:28.